Italian City & Town Guidebooks Reviewed 2019 - Rome, Florence, Venice & More. 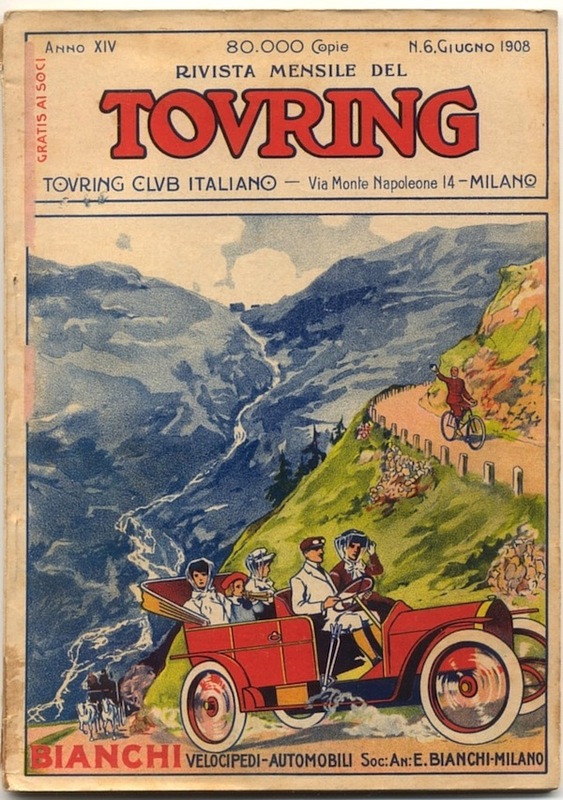 What are the Best Travel Guidebooks for Italian Cities & Towns? Which Guidebook is Better? Rick Steves, Lonely Planet, DK Eyewitness or Frommer? Besides full Florence coverage with itineraries, it includes Siena, Lucca, Pisa, and a bunch of hill towns. Good maps and extra consideration like Florence with kids and suggested itineraries. Good info on opening hours, fees, etc. This book has more coverage of the subject than the full Rick Steves Italy Guidebook - useful for a stay of four days or more. Largely the same info as in the full Italy Rick Steves Guidebook. The reduced size makes it good for a 2 or 3 day Florence visit. Visually very appealing, but the total amount of information is less. This book uses DK's new design which seeks more utility in the internet age and weighs less than previous versions (by not using coated paper). The Amazon reviews are conglomerated with the older edition so use date-sorted reviews when judging. We would still be lost if not for Michelin's laminated maps. Florence's Duomo is stunning; so was its creation. Ross King's bestselling historic novel takes you back to 1418 to relive the building's development and understand this engineering marvel. Best Italy Guidebooks 2019 Reviewed - Advice on Choosing & Planning. What's the Top Italy Travel Guidebook for Rome, Florence & Venice? Which Is Recommended? Rick Steves Italy guidebook or Lonely Planet Italy guidebook? Let's start off on the right foot: there are no best travel guidebooks. All have strengths and weaknesses, and all travelers have different approaches and needs. We have recently completed our independent review of almost all the popular Italy travel guidebooks. We give you our recommendation along with enough description help you decide if it fits your needs. No guidebook fully covers all of Italy. Use the Amazon 'Look Inside' feature to see the Table of Contents or Index to make sure your areas of interest are covered. Approachable and fairly thorough with straight ahead writing. The comprehensive coverage has good clear maps interspersed in the articles and it includes more out of the way sights. The index can be somewhat spotty. Complete info on the frequently visited sites in Italy presented in an effective format. The writing imparts a feeling because the places are actually selected by RS himself. Includes excellent maps, suggested itineraries, good info on opening hours, fees, etc. They don't include many of the less traveled places. No coverage on Sicily, Sardinia, or Puglia (Apulia). Dining with Artusi - Where Italian Cookbooks Began. Enjoy The Original Artusi Recipes from 'The Art of Eating Well'. Visit the Restaurant or Fabulous Festival Dedicated to Artusi in his Emilia-Romagna Hometown. The Founder of Italian Cooking with 'L'arte di Mangiar Bene' Becomes Real for Food Lovers. In a country of epic heroes, grand empires, and daring military conquests one of my very favorite famous people is a mild mannered retired silk merchant who enjoyed eating the local dishes when he traveled around Italy in the 1800's. Why is he of any note? Because he is Pellegrino Artusi - the author of 'Science in the Kitchen and the Art of Eating Well' (La Scienza in cucina e l'Arte di mangiar bene). Today anyone with a word processor and access to the internet can be a culinary author - I'm guilty myself. But in Artusi's day it was a new concept, and although to the modern reader the recipes sometimes appear a bit vague (a pinch of salt, cook until done) they were marvels of precision in their day. Not only that, he was so committed to his endeavor that when publishers rejected his book, he self-published the work. One of the best-selling non-fiction books in Italian history - in 1891. And today in his hometown, there's a restaurant that offers dishes made from his original recipes, as well as a large festival dedicated to Pellegrino Artusi. from the Papal State to the Duchy of Tuscany! Artusi oversaw the recipes, while his cook and butler, Marietta Sabatini and Francesco Ruffili, measured, recorded, tested, tasted, tweaked, and refined. Not only was the approach new, the timing for a national cuisine was perfect: Italy had been fully unified only in 1871, and 20 years later his book was on sale to the first truly Italian generation. Making Italy into a unified nation was a long process that continues to this day. To form a modern republic from the individualistic dominions that had occupied the Italian peninsula for centuries presented some serious assimilation issues. Recognizing dishes from any region other than Tuscany as Italian was radically inclusive. Recipes from Piemonte, Liguria, Calabria, even Sardinia and Sicily were included in a book about Italian food! Artusi is widely recognized as one of the important cultural unifying forces in changing Italy from an area of fiefdoms and regions into a national entity. He wrote engagingly and fluently in the new “Italian” language, was elegant and polished and comprehensible, and he interspersed his recipes with anecdotes and reflections to make the book enjoyable reading. 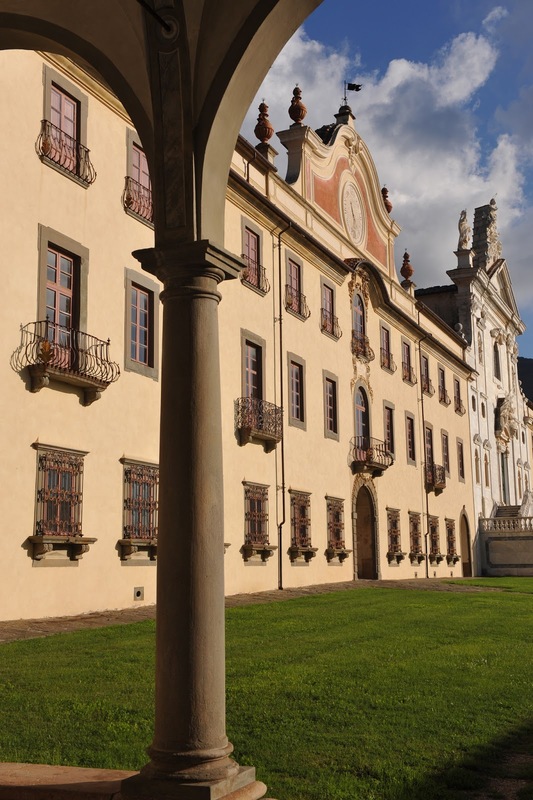 The Rocca Albornoziana in the center of Forlimpopoli, Emilia-Romagna. 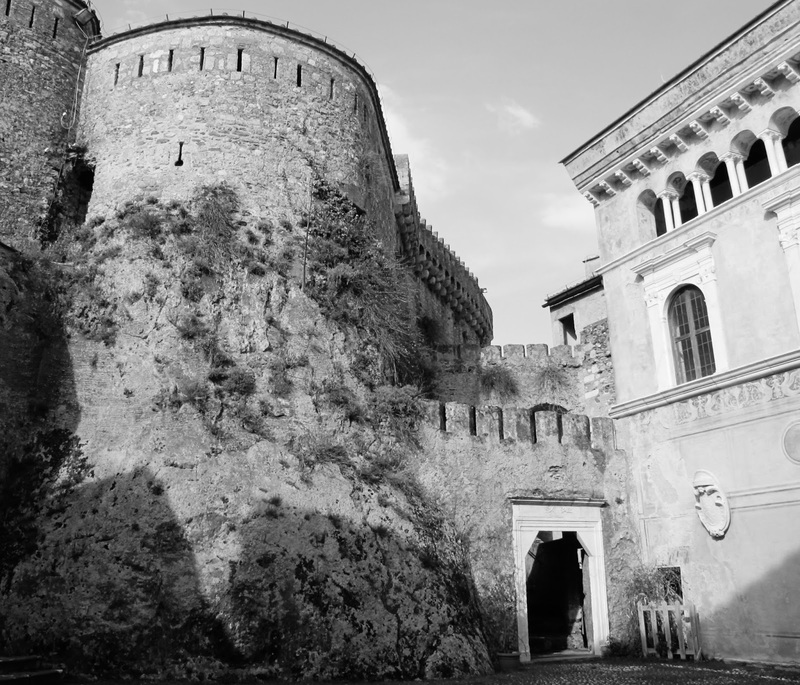 The 14th Century fortress is surrounded by the Artusi Festa each June. Artusi was born in 1820, when the world was very different. 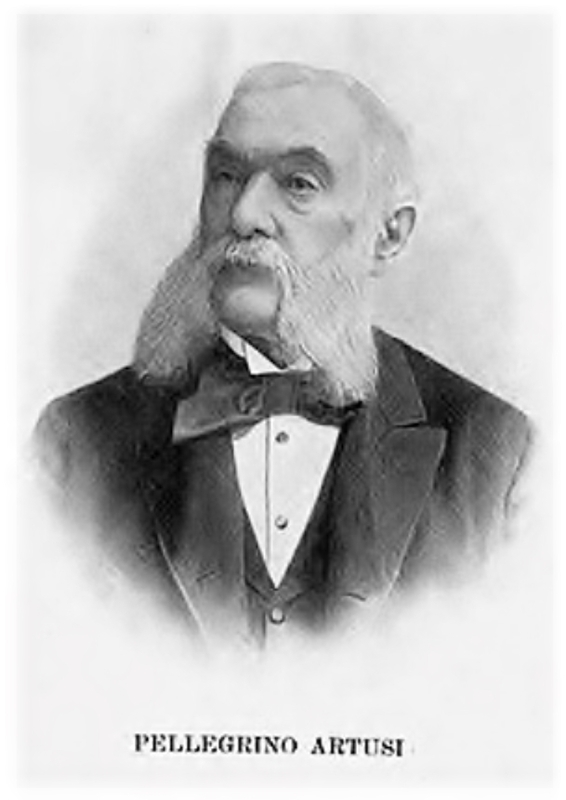 His hometown, Forlimpopoli, was close to Bologna, and after a prosperous and comfortable childhood he spent a lot of time in Bologna, socializing with the students at the University and enjoying life. So far, so good, but in 1851 there was a famous bandit called “ Il Passatore”, The Smuggler, who terrorized the wealthy. The Smuggler came to Forlimpopoli with his band of thugs and raided the local theatre on the night of a popular play. He held the audience hostage until they paid up, then released them slowly, and his men attacked and raped some of the young women. Artusi's sister Gertrude was among the victims of the vicious attack, and never recovered; she was institutionalized for life. The times were violent, disorderly, dangerous, and it was no coincidence that the next year the family moved to Firenze. A Classic Italian Hike for Families, Couples, Trekkers. A Guide to One of Italy's Best Easy Hike Destinations. A Great Thing To Do with Children & Teens. A Stunning Picnic Spot. An Excellent Attraction near Reggio Emilia (1 hr.) Parma & Modena (1¼) Liguria & Lunigiana (1½). The Pietra of Bismantova provides spectacular views, but the easiest trail only takes 20 minutes and it's family friendly. Treat yourself and your family to one of the great natural attractions of Italy. This spectacular geologic feature will remain in your memory and your photos for much longer than a postcard or the next spaghetti bolognese. The oddly named Stone of Bismantova will surprise you with a majesty that speaks to the nature in your soul. It stands above its surroundings as a sentinel, as a symbol, as an aspiration. Primitive man climbed it, ascetics were drawn to it, local culture incorporated it, Italian youth are introduced to nature by it, and you can easily experience it for yourself. You will see its unmistakable form rising isolated from the landscape from miles away. The Pietra dominates the surrounding area - overlooking it from a height of about 300 meters (1,000 feet) and many sections of the cliffs are 100 meters high! It is roughly one kilometer long by 240 meters wide. The unique shape is due to the type of limestone which forms the mountain. Simply put, it resisted erosion better than the surrounding area over the last 20 million years. The rock was formed from sediments in an ancient sea and there are fossils in some areas as well as visible patterns from undersea currents during deposition. The rocks are partly sandstone but mostly calcarenite which is the limestone equivalent of sandstone. This is formed from deposits of carbonate bits that were pressed together into rock from diverse sources such as sand-sized limestone fragments, shells, corals, shark teeth, oodles of ooids (precipitated calcite), etc. Of course, it was inhabited by prehistoric people - there's a Copper & Bronze Age archeological site and a necropolis near the Pietra's base at Campo Pianelli. Subsequently, there's evidence that site was used by Etruscans and Celtic-Ligurian tribes. Naturally, the Pietra was fortified, probably until the 15th C. - first by the Romans, then the Byzantines, the Longobards, then Charlemagne, and finally by Matilda of Canossa. There little evidence left of the fortifications today. The views from the top of Bismantova are endless. For the surrounding towns. the history concerning the Pietra is religious - involving devotion and pilgrimage to the Madonna della Pietra. 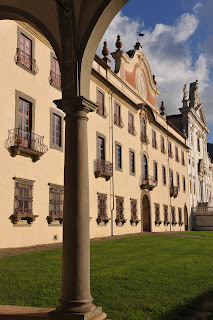 The Eremo di Bismantova (Hermitage) at the base was established by Benedictines in the 1400's and rebuilt in the 1600's. There are frescos inside from the 1400's, including a depiction of the Madonna. Today, the Eremo is part of the Marian order. Dante Alighieri visited Pietra di Bismantova in 1307. The Mountain of Purgatorio, mentioned in Canto IV of Purgatorio in the "Divine Comedy", was seemingly inspired by Pietra's unique formation. As if to inspire hikers, the Garden of Eden was located on top. In the last few centuries, the summit was only used for grazing which explains the nice pastures and the easy views we enjoy. Slowly, the trees are regaining control, but it's slow going due to the altitude and the nearby Alps. 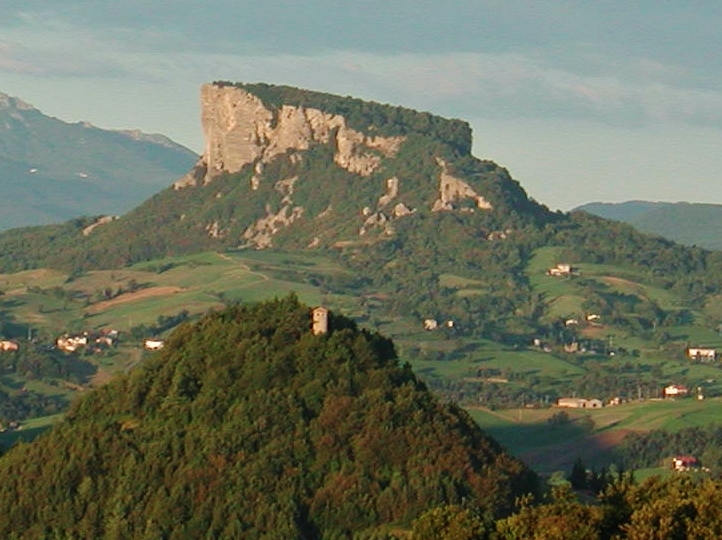 Today the Pietra di Bismantova is protected as part of the National Park of the Apennines. Parco Nazional Apennino Tosco-Emiliano (EN). The starting point of Pietra di Bismantova activity is Piazzale Dante at the end of Via Bismantova in Castelnovo ne' Monte (RE). See GETTING THERE below. There is free parking as well as the Eremo (Hermitage) nearby, the Rifugio di Bismantova bar-restaurant and the Albergo Forestiera. ★Before you go: Download this Pietra Bismantova Hiking Map to a portable device. Why? It is clearer than the posted map on site, and there are no trail signs or maps on the actual summit. There are also no services on the summit, so at least take sufficient water with you. The easy hiking trail on Italy's Pietra di Bismantova in October. This is an active recreational attraction, so there are several choices. The most popular climb is a section of Trail 697 which angles directly to the top. It's the shortest, it's not particularly hard, and takes about 20 minutes. The second most popular is the 6 km. 'L'anello della Pietra' (Ring around the Stone) using Trail 697 which combines a very scenic nature walk around the Pietra with a visit to the summit. It takes about 2 hours. Both routes leave from Piazzale Dante and below we describe both ascents, as well as the most popular part of the summit and the descent they share. We think school-aged children who like hiking will have no problems with these two hikes. -Several other trails, such as Trail 699, which are steeper, rockier, and reach the top from different directions. -Two via ferrata routes are in place for an alpine experience (i.e. straight up). -There are also many sport rock climbing opportunities on the cliffs with numerous bolts apparent. -Climbing (bouldering) is also an attraction on the gigantic fallen rocks around the base of the Pietra. A Beautiful Seaside Walk along the Portofino Coast. The Red Carpet Walk from Rapallo to Santa Margherita. 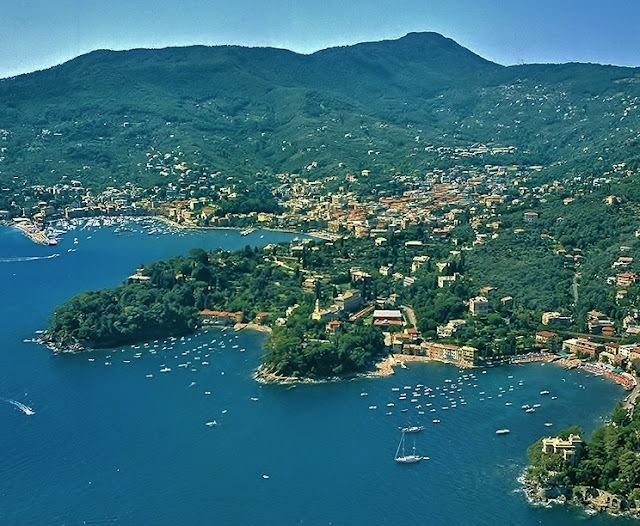 A Great Thing to Do - Explore Between Rapallo & Santa Margherita. Enjoy the Attraction of Villas, Free Beaches, Grand Hotels and a Baroque Church. A beautiful coastal walk through San Michele di Pagana with its three bays: R. to L. Pomaro, Trelo (Travello), & Prelo. Santa Margherita is beyond with Parco Naturale di Portofino as a backdrop. Photo: Archivio Storico della Regione Liguria. It's now a pleasure to walk from Rapallo to Santa Margherita Ligure (SML) along the coast between these pretty Ligurian towns - thanks to recent sidewalk improvements. The walk was inaugurated with the World's Longest Red Carpet - 8 km. from Rapallo to SML to Portofino. The carpet is gone now, of course, but the beauty remains. This article covers the first half of the coastal walk, the second half is our popular article Walk or Hike from Santa Margherita to Portofino which also describes an easy hill hike with beautiful overviews. The route is full of sea scenes and garden glimpses and villa views so you can really get a feel for this beautiful area. We recently explored it and we discovered four free beaches (spiaggia libera); a WWI Memorial forest; a Baroque church; and all the while we were surrounded by grand mansions and hotels, gardens and the sea. Our walk passes inland behind Villa Lagomaggiore on Capo Pomaro. The walk is great for both kids and adults and the hills are gentle. This route is about 3 km. (2 miles) and it can be done in 45 minutes, but don't you dare hurry. Allow 90 minutes to be leisurely, and it's easy to spend a couple of hours if you are experienced in smelling the roses. It is quite doable with a stroller except harder in the Punta Pagana section where there are two short sandy beaches and two staircases. There are some services at the first beach at Pomaro about 1/3 of the way, but bring some water anyway. You can create a personalized round trip using the bus that runs along the seaside road or by boarding the ferry at SML or Rapallo or Portofino. See the links at MORE INFO below. OUR DIRECTIONS: WALK THIS WAY. We begin on the western side of Rapallo - across the canal-like Boate river - where we follow Corso Cristoforo Colombo as it heads toward the sea from the intersection with Via Aurelia Occidental. This is near the Hotel Stella and there are blue traffic signs pointing the way to SML and Portofino. As you start, there are good views of Rapallo's extensive harbor which is a major port for private boats of every description and tax bracket. Soon the road curves away uphill past the Hotel Excelsior Palace. Corso Colombo changes names, but it's always the largest choice. It's known later as Via San Michele di Pagana then as Via Bridiga Morello a/k/a Strada Provinciale 227 (SP227). We walk all the way from Rapallo to SML on the sidewalk along this road and we just take one detour at Travello. We describe several sights you will miss without that detour around Punta Pagana (a small peninsula), and we add details on some places you'll see along the way. The Best Tour of Rome's Colosseum Reviewed. cubic meters of travertine stone. That stone was later used to build many Roman churches and several palaces of Popes. Is a Colosseum Guided Tour Worth it? Read our Third Ring Colosseum Tour Review with Tips and Advice. Where to Get the Best Photos. Can We Skip the Line? Colosseum Guided Tours in English. Should You Book a Guided Tour or Tour on Your Own? We have done both, and we believe that a Colosseum tour / Roman Forum tour is the best choice. We visited the Colosseum and the Roman Forum by ourselves on our first trip to Italy in 1984. We enjoyed it a lot, and it was easier then – inexpensive and no security. However, we now know that we missed a lot of the best stuff, and our little guide book skipped over many features that would have really interested us. Both of the sites are just too packed with layers of history and ancient buildings to be enjoyed fully without help. The arena floor was wood covered with sand, 270 by 160 feet. Underneath were these walls of the hypogeum, a two-story underground of tunnels connecting training rooms for gladiators, cages for wild animals, and storage rooms hidden under the arena floor. Elaborate machines lifted scenery and animals into the arena. Photo from 2nd level with lens at 55mm. Switch to a new millennium. In May, 2018, we went on a guided tour* of the Colosseum and the Roman Forum and we were blown away by the wonderful experience. Not only were the lines at entry and the security check made easy, but the sites themselves came alive. Our guide presented fascinating history, facts, and anecdotes at every stop, and answered every question we had. It was very much like we had never been there before. Self-guiding is a fun way to see many places, but not the Colosseum and the Forum. Which Tour - Top Level, Underground or At Night? views are good but sometimes you'll have to wait for a spot. We booked our tour with the The Roman Guy. Founded by a young American - Sean Finelli - just 10 years ago, we selected them because they have a strong customer-oriented attitude and consistently good reputation. For the Colosseum we chose the 3 hour Restricted Areas Belvedere Top Levels Colosseum Tour which also includes a Roman Forum tour. We especially wanted the special viewpoints for better photos and this tour includes the restricted access third level - a/k/a the Belvedere. Our second, back-up choice was the best-selling Colosseum Underground Tour with Roman Forum & Palatine Hill. The group was manageably small – about 15 people, and we each had an earpiece receiver for easy listening. Our guide was Giulia and she was hands down the best guide we’ve ever had in decades of travel. This smart Roman has several advanced degrees in history and was so knowledgeable she never needed to use a script. She is also friendly, unflappable, and dedicated to seeing that we had a good experience. Which we certainly did. TIP: If you book a tour with The Roman Guy, use the DISCOUNT PROMO CODE shown below. Our Top Levels Colosseum Tour Described. sense of the Colosseum's history. The Colosseum. After we met outside the Colosseum, Giulia guided us through the entrance lines and security with just a small wait. FYI, there's no way to truly Skip-the-Line at the Colosseum. The best you can do is take a guided tour where the wait time to enter and get through security is minimized. Our tour was a morning affair, which we strongly recommend because the longest waits occur when the 3,000 person maximum capacity is reached and new entries are paced – often around late morning. Once inside, our Roman Guy guide, Giulia, gave us a brief but fascinating architectural and historical overview of the Colosseum so we'd know what we're seeing. Things like where it got it's name (it's not the building size), why there are holes in the walls, why was it preserved at all, how the seats were allocated, what is the connection between the Colosseum and the word 'fornication'. Did you know that the present exterior is actually an interior wall – the original exterior wall is gone – 100,000 cubic meters of stone! Did you know there's no evidence any Christians were martyred here? Freshly and smugly knowledgeable, we then headed up the steep entrance ramp ( a vomitorium in Latin ) to the first ring. Below Mighty Massa Castle, a Perfect Tordelli Waits. Tordelli are Tortelli are Tortelloni. Enjoy this Many Named Pasta at a Tordellaria. Eat Massa's Unique Piatto Tipico in an Authentic Local Restaurant. Malaspina Castle still watches over Massa, Tuscany. CC by Richard Avery. Dining room at Abacab Ristorante & Tordelleria, Massa, Tuscany, Italy. 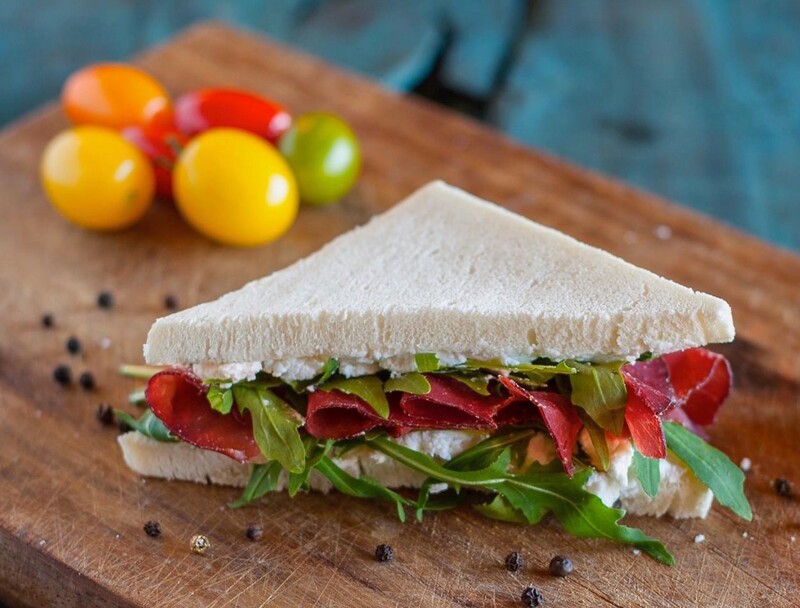 If you'll be visiting the castle or are shopping in Massa, of course you'd like to know and try some of the food specialties. Well, there's a standout. Tordelli alla massese is rightly famous and it's delicious. It's made with a sturdy egg pasta, a rich and satisfying filling with a 'Massese' taste, and a sauce that's like the country cousin of bolognese: more robust, more sincere, more down to earth. The dish is so much a part of Massa that there are variations on the basic tradition, and there are both shops and restaurants devoted to tordelli.